My kids would be in heaven if I bought them Coco Pops. However, I just can’t compute the idea of eating chocolate at breakfast. My sister, married to a Frenchman, has fully embraced the whole French custom of dunking a baguette into a bowl of hot chocolate for breakfast. This means that when she and her tribe come to stay (3 kids under 13), they invariably bring along a box of Coco Pops. And I'm branded mean and unfair by my lot. So, after their last visit, I had a change of heart. 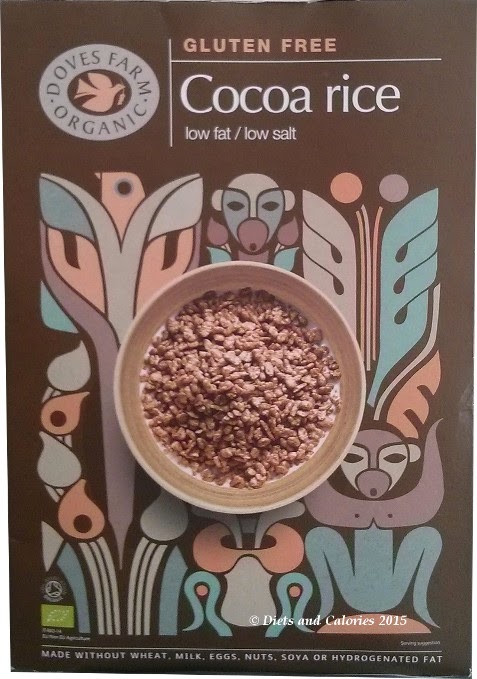 While scouring the aisles in my local organic wholefoods shop, a moment of weakness saw me pick up a box of Doves Farm Organic Gluten Free Cocoa Rice, thinking perhaps they may be slightly ‘healthier’ than their counterparts. I’m not allergic to wheat, nor am I gluten intolerant, neither are my children thankfully. However, I have been tempted to try out some of gluten free products to see how they compare. I certainly didn't expect Doves Farm Cocoa Rice to be any lower in calories. In fact, they have 379 calories per 100g, compared with Kellogg’s Coco Pops which have 389 calories. And the sugar? Well, Doves Farm Cocoa Rice has 21g of sugar compared with Coco Pops which have 35g. So that’s a plus point for Doves Farm. What about taste? 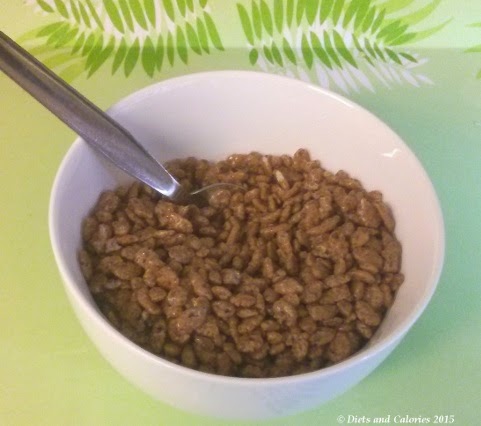 When pouring them out of the box, they look and smell exactly the same as Kellogg’s Coco Pops. Tasting them dry, they’re crisp and crunchy and taste sweetly chocolatey enough to satisfy my kids. Without telling my youngest what she was eating, I poured her a bowl to see what she thought. Naturally she was over the moon, thinking I’d bought Cocoa Pops. While happily munching her way through them, there was no comment about noticing anything out of the ordinary. The only thing she did notice was that the milk didn't seem to be as chocolatey as usual. While I am unlikely to buy this cereal again, it’s not because of its taste or texture. I’m just not happy about my children eating chocolate and sugar for breakfast. The good points about this cereal include the fact that all the ingredients are organic, plus cocoa has certain health benefits (although there is only a tiny bit in the cereal). It’s also low in fat and salt. And of course, it's a suitable choice for those who are gluten intolerant and like this type of cereal. Unfortunately, there are two types of sugar in Cocoa Rice – sugar and glucose syrup. This means it’s still a high sugar breakfast cereal. Doves Farm Organic Gluten Free Cocoa Rice is sold in a 375g box and can be found in larger supermarkets as well as some health food shops. Ingredients: Wholegrain rice (organic) (71%), organic sugar, organic cocoa (4%), organic glucose syrup, salt. Nutrition information per 100g: 379 calories, 5g protein, 85g carbs, 21g sugars, 1.5g fat, 0.5g saturates, 2.8g fibre, 0.01g sodium.